Homemade Baked Mac and Cheese Recipe, a win-win for the family! Lighter in calories but still filled with cheesy goodness! 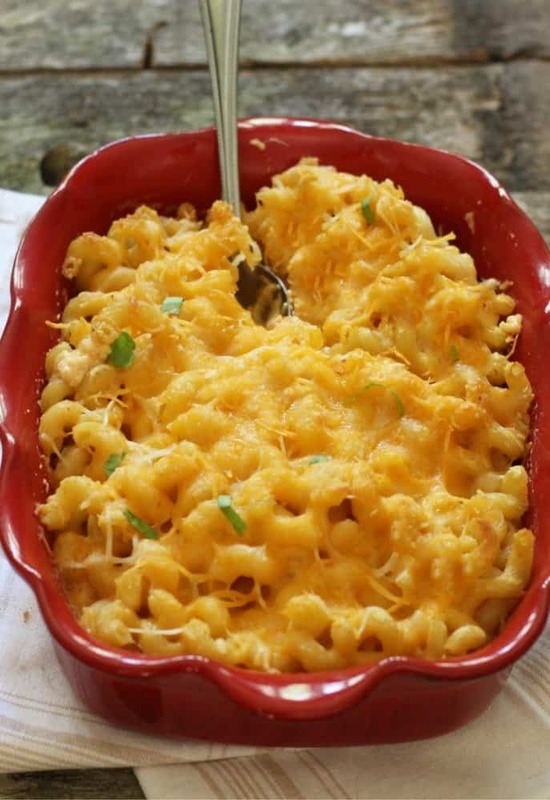 No one will miss the extra calories because they will be enjoying a cheesy mac and cheese! Use high fiber pasta, low-fat cheese, low-fat milk and you have a game-changing lower calorie and lower fat mac and cheese that will blow your socks off! My Baked Macaroni and Cheese is loved by kids and adults, a great party pleaser. No one knows I am using lighter ingredients because the flavor is fantastic! My love of Lighter Baked Homemade Mac and Cheese! Who doesn’t love homemade mac and cheese! When my older kids were younger, I loved when their friends came over and I offered them mac and cheese. The kids never had homemade mac and cheese! They were all mesmerized by the color and taste! The kids love my mac and cheese! So it began, after getting a mac and cheese call, I’d make a batch of my low-fat mac and cheese for that family and attached the recipe! My Friends New Love of Baked Macaroni and Cheese! The results, a reduction in the sales of boxed mac and cheese in my neighborhood! An increase in Easy Homemade Mac and Cheese Recipes! Trust me, this is an easy recipe and you won’t buy a box of mac and cheese again! My one girlfriend who finds cooking the enemy still makes this recipe all the time. Granted this is the only recipe she likes to make but for me at least she can make mac and cheese! She is so lucky! Her hubs can grill and her kids follow my blog and cook. I used one of my favorites, Ronzoni® Smart Taste Pasta – with extra fiber! I love the taste of the Smart Taste pasta and it has extra fiber, which is always great! You can also use whole wheat pasta, or a combo of whole wheat and high fiber! What ingredients can I use to lighten up Homemade Mac and Cheese? Using high fiber pasta will always be a benefit to any recipe. low-fat milk, skim milk, fat-free half-half can also be used. low-fat cheese. Sargento makes a good low-fat cheese and it melts well in this recipe. whole wheat flour or almond flour can be used to make the roux. What are the origins of Macaroni and Cheese? Kraft Macaroni in the box came about in 1937. It is thought that the origins of Mac and Cheese came from an Italian dish but the specifics are not clear. I found history notes that Thomas Jefferson’s daughter served a parmesan and macaroni dish that later changed to a macaroni and cheddar cheese recipe. Can Baked Macaroni and Cheese be frozen? Absolutely, i generally make two batches. One to eat and one to freeze. I place wax paper on the to of the cheese, spray with non-stick cooking spray. Wrap the pan very well with plastic wrap and then a layer of aluminum foil. if you have a food saver, use that to ensure no freezer burn. What types of pasta can I use to make this mac and cheese recipe? Any small sized pasta will work with Baked Mac and Cheese. Here are a few I use regularly to make this recipe. I have a dairy issue, are there any substitutes for the milk in Mac and Cheese? I have used almond milk to make mac and cheese for my daughters who have dairy sensitivities. My older daughter loves it, the younger loves using milk. Can I make this healthier with veggies? Yes, yes, yes! Feel free to add into the pasta water either fresh or frozen veggies for the last 4 minutes or so. I add broccoli, spinach, or kale a lot! A great way to sneak in veggies. Enjoy your mac and cheese! The key is portion control. I make a large salad to accompany the lightened up mac and cheese! Everyday tip: I have a big family so this recipe works well for us, with a pound of pasta, my sons eat a lot! If your family is smaller, you can make this as written and split between two casserole dishes and freeze one for later for your family! When you make one of my recipes, tag it with #everydayeileen so I can also share it! If you don’t know about Yummly, sign up for an account today and save my recipes and any other delicious recipe in one tasty space! Yummly is one of my favorite recipe collection sites! Homemade Baked Macaroni and Cheese, using low-calorie ingredients reduces fat but the cheesy flavor is still amazing! A favorite one pan comfort dish for kids and adults. Spray a 9 x 13-inch baking dish with cooking spray, set aside. Cook pasta according to package, reduce cooking time by 4 minutes. In a medium pot, over medium heat, melt butter. Add in the flour and whisk for about 2-3 minutes. Increase heat to medium-high, add the milk, continue to whisk until mixture becomes thick and bubbly. The mixture should be able to coat a spoon when thick enough. Add the cheddar cheese, Colby cheese, Parmesan cheese, Dijon mustard, smoked paprika, and season with salt and pepper to taste. Combine until smooth. In the baking dish, combine the cooked pasta and the cheese mixture. Sprinkle the top with the Panko breadcrumbs. Cover with aluminum foil and bake for 15 - 20 minutes. Remove aluminum foil and continue to bake about 5-10 minutes. Ready to serve. Note 1: Use your pasta of choice, gluten-free pasta works well also. Mac and cheese that you get at quick service restaurants can be really heavy, I like that this is a lighter version. GREAT idea! I definitely have to try! GREAT idea! I will definitely have to try! Oh yum this sounds like an awesome recipe. My kids really liked mac and cheese too but some of those recipes are hardly healthy. I hope your family enjoys this one and I don”t think they will miss the extra fat! Yum! 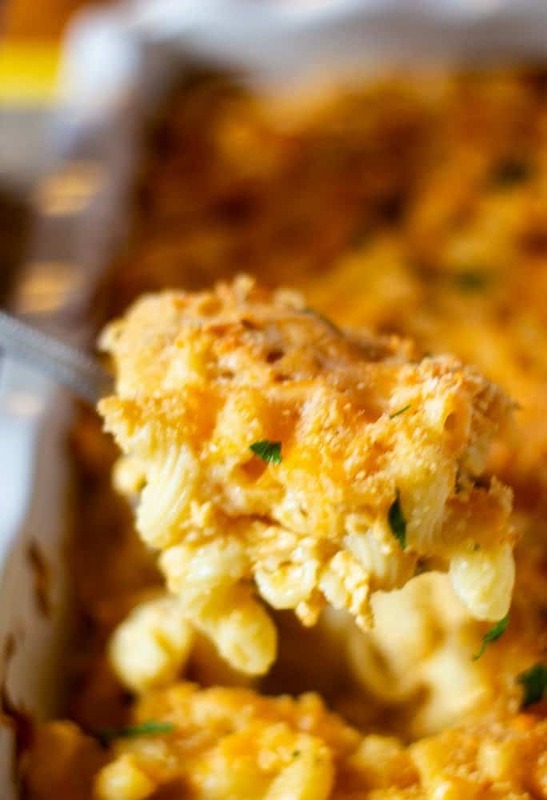 mac and cheese is my favourite and i have GOT to try this lighter version. thanks for sharing! Looks great! I’m a huge mac and cheese fan, thanks for sharing your recipe with us! Thank you Olivia – hope you enjoy! This looks really good. I wouldn’t think to use mustard. That looks yummy! I love that this is low on fat. I can’t wait to try this. My daughter loves mac-n-cheese as much as I do! I’m hungry just thinking about it. A lighter version will do both of us good. We both have gained a few pounds recently. This is a good low fat tasty one :)! This sounds so yummy and easy to make! May try this out this weekend. I really is easy and Yummo! I hope you enjoy! Omg this Mac and cheese sounds so yummy! Total comfort food! I would try this with gluten-free pasta and flour, because the pasta alone didn’t taste very good, but with the ingredients you listed – I bet I couldn’t tell it was the same pasta. I think that would work – let me know how it goes if you decide to make this one! Great way to cut calories without losing flavor. Thanks! Mac n cheese is my favorite. This looks like a great recipe to try. Thanks Chanelle, I hope you enjoy! My boys love mac and cheese. This looks like a recipe for them. me too! I don’t think I ever had it any other way! This looks delicious! I’ve actually never tried making Mac and Cheese. I think it might be time to try! I hope you do Jolleen! This is one of my favorites! Thank you Cklaudette! I agree, from scratch always the way to go! I bet this tastes SO much better than boxed mac & cheese. I so need to make this for my kids – yum! It really is a great low- cal recipe. Freezes well too ad so much healthier than a box :)! This is one of my favorite food. your recipe was look tasty i would love to try your recipe. Mac and Cheese is one of my favorite dinners. Your recipe looks really tasty. This is amazing! Mac and cheese is such a rich dish, so it’s not for everybody. With this recipe, that could change, thanks for sharing! Thank you – i hope everyone tries it – so much less in calories! I always love learning about other people’s mac n’ cheese recipes! 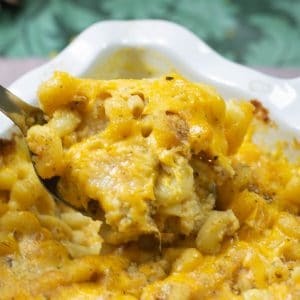 My one son is a mac and cheese junkie, I have tried so many different recipes! So many varieties – I hope you try this one! Hi Eileen, thanks for this amazing recipe!! I love Mac and cheese, and a healthier version is definitely a great motivation to eat some more! Thank you Milton, I hope you enjoy! This looks yum! I’ve never had mac and cheese in the way you guys do it before! It’s great you’ve found a low calorie version – the nicest things are always the things that are the most unhealthy for us! This looks and sounds amazing!! We are going to have to try this recipe! I hope you do and enjoy! I cannot tell you how much I love this. I want to make it tonite. Thanks Robin – I hope you enjoy!